I've got lots to write about today. Judy pulled #8 for March's 2012 UFO Challenge project. I'll be making her design Road to Brownwood. Not sure at this time what colors mine will end up. I very much like her use of scrappy purples, green and yellow. Need to check the stash and get busy on this beauty. 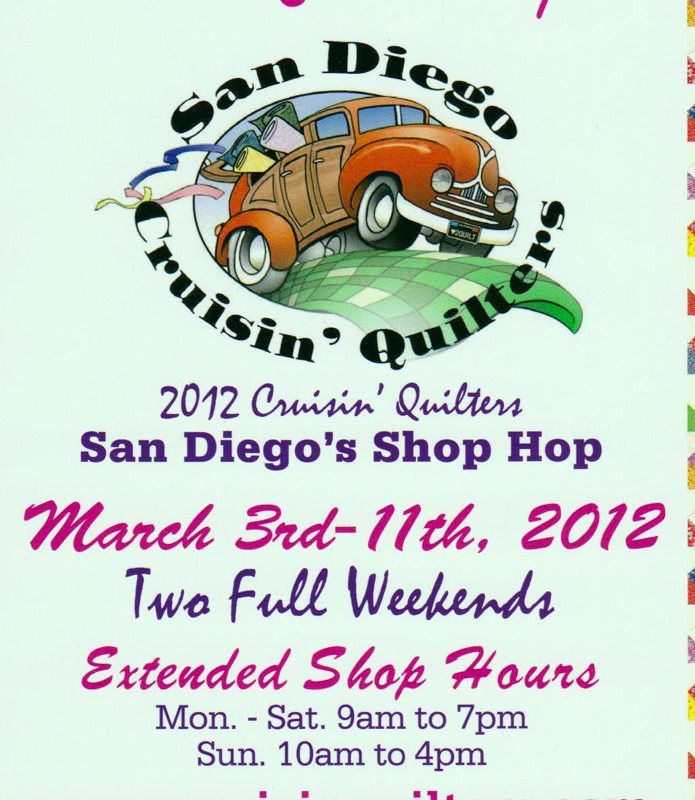 The 2012 Cruisin' Quilters Shop Hop starts this weekend in San Diego. I'm not sure I'll get to all 14 of the shops this year, but I'm going to give it a go! Maybe I'll see you out there. I'll be wearing my kwiltnkats logo T-shirt...look for me :)! Here's my other March project. Jo's Country Junction's Quilt Square Quilt Along. The star design is for this month. 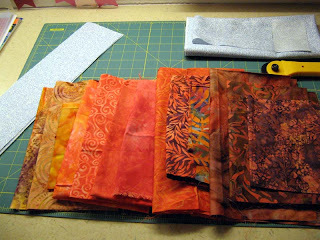 I'll be using similar colors to go along well with the log cabin and bear paw designs from January and February. 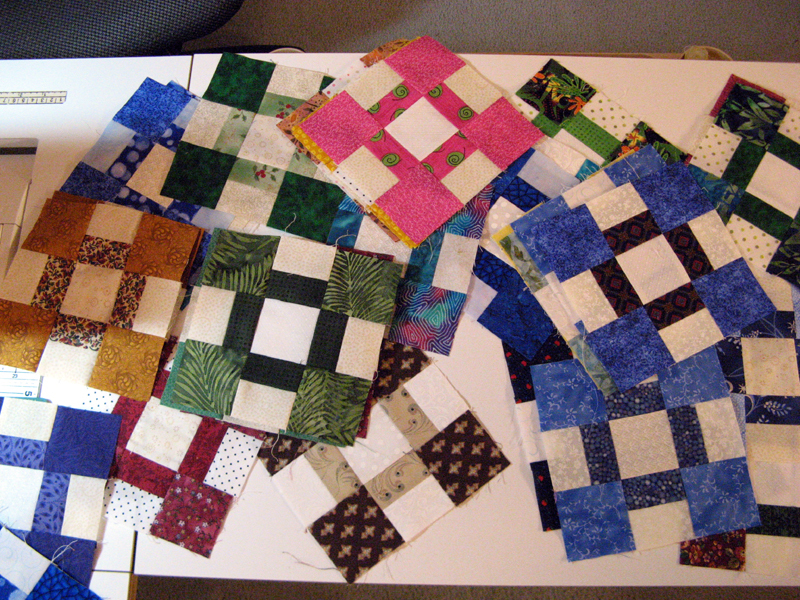 These blocks along with six others will come together to make a sampler at the end of 2012. I have the blue string blocks removed of paper on Part 7 of Kordova Klosure. Still need to pick up the flying geese Bloc Loc ruler for squaring up the 127 flying geese units. Then it's on to assembly. Pictures of Part 7 coming soon. 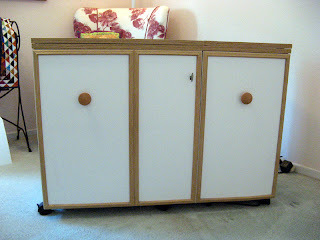 The best part to write about is that my Koala Sewing Cabinet is being delivered tomorrow! I'm so excited. I have the insert already and a borrowed chair (just until mine arrives)...so I'm set! I'll be sure to show you my new set up after a bit of arranging. Come on tomorrow! I had a very good sewing weekend. 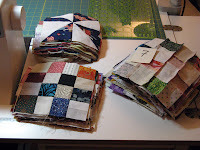 I finished all the sewing for Part 7 of Bonnie Hunter's Orca Bay Mystery. I've been wanting to get back to this project since setting it aside in January. Too many projects at the time that had deadlines. 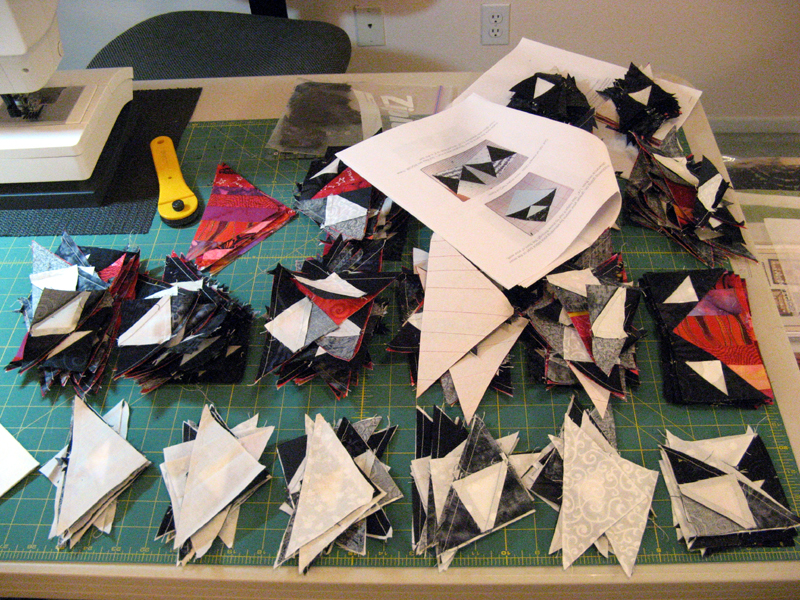 The first photo is the flying geese that were made from the string blocks and a pieced triangle in each corner (there were 127 of these). You can get a glimpse of one on the far right. I've to got to take the paper off, iron and trim these up yet. 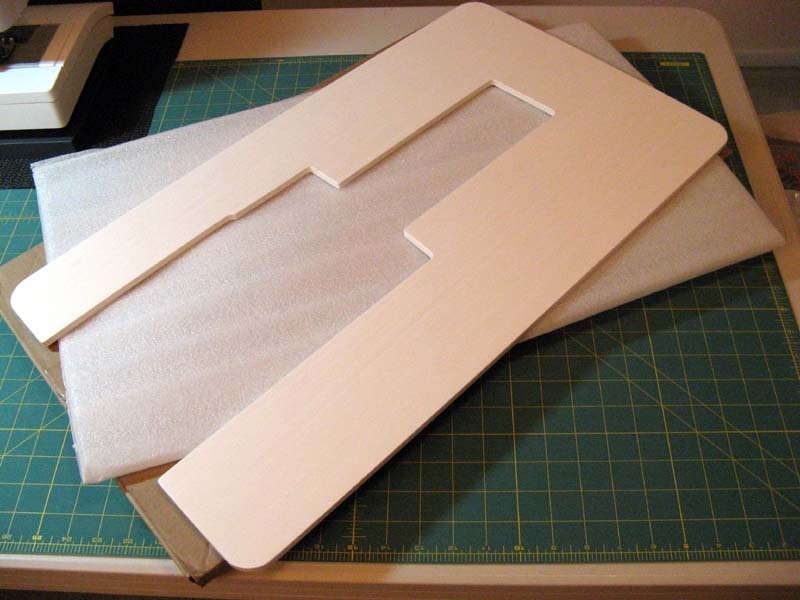 I plan on purchasing the flying geese Bloc Loc ruler to help me do this. 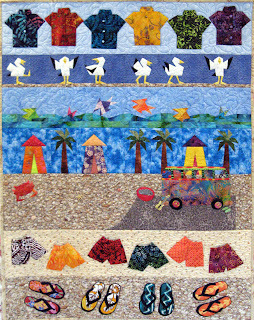 One is available at Cozy's Quilt Shop...I'll be heading that direction sometime this week. This is the second portion of Part 7. Since I know the outcome of the mystery I know now that these components, 100 of them and the two hour glass blocks at the top make up the border. I used the HST Bloc Loc ruler to square these up too. I'm pretty certain that I'll be making my project into a king. I've seen other projects finished on the Yahoo Group Quiltville Chat and found a super sized Orca Bay that I like. I hope to be in a position later this week to put the top together. I still have to remove the paper from the blue string blocks as well. Kordova Klosure is on it's home stretch! Hope your week has in store all that you want. 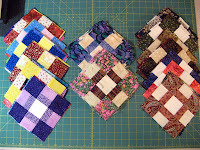 See other great projects in work at Patchwork Times. I had a pretty good sewing week. I finished up my Kokonut No! early in the week and finished the Bear Paw Block. Both of these are February challenges. I thought I'd show you the back that I've managed to put every last bit of scraps into for Kokonut No! I even have enough of one of the oranges for the sleeve. And three of the greens for a scrappy binding. I think the flying geese blocks should face up...don't you? Now on to Kordova Klosure. I'll be trying to get this one done before March challenges are announced. I'm in full production with Part 7. Others probably think the string blocks were the most labor intensive, but by far to me is Part 7. I've got just a few more to assemble then it's the finish with Part 8; putting the top together. Maybe I'll be reporting the fabric used in this project next Sunday. Looking pretty positive at this point. Jeanne and Sally dropped off their Chunky Churndashes Blocks. Now I've got them all...time to divide them up! End of February close and almost 100 yards this year already! How about you? 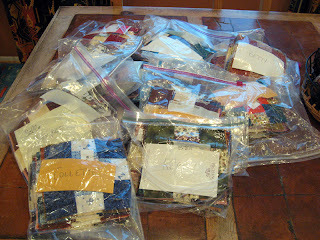 See others progress getting through their fabric stashes at Patchwork Times. 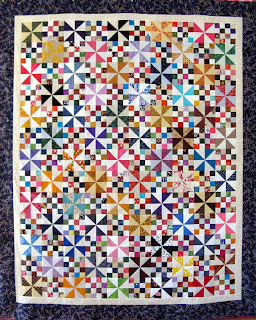 I finished my February 2012 Quilt Square Quilt Along with Jo's Country Junction just now. Look how cute it is. This block introduced gold, green and black. The green is barely visible...finishing just 1/2" x 1/2". Okay Jo I'm ready for March. The post person did well today, delivered are Connie's blocks. Nice work! Two more to go and I'll be sorting them all out for redelivery. 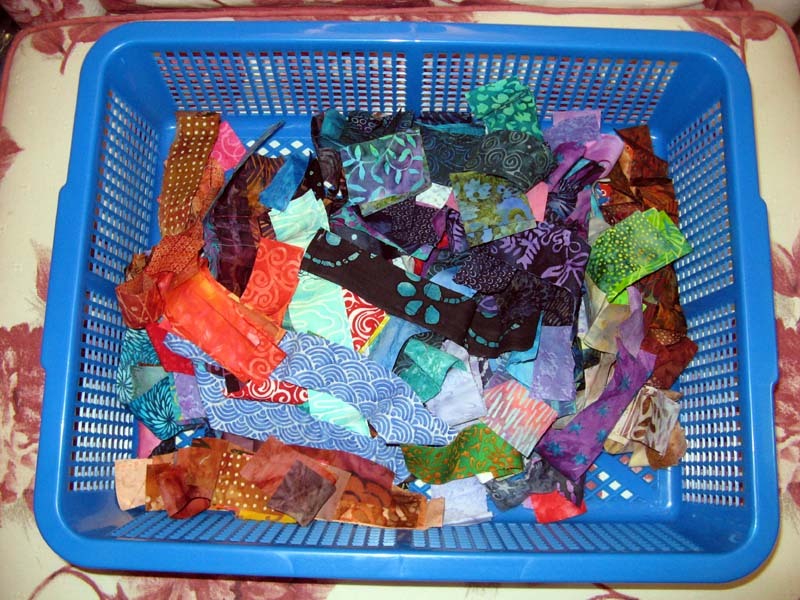 I should be done with the sort during the week and be able to start getting them to all the swappers next weekend. It's going to be a hard call on what color fabric goes into my hour glass blocks other than the neutral. Looks like the decision will be mainly on my stash! No delivery today drat. I did get the borrowed chair until mine arrives. 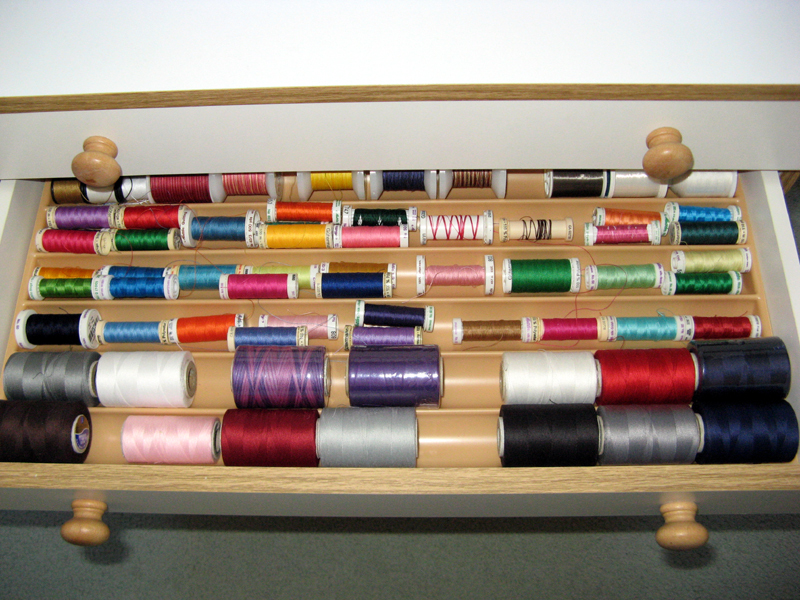 At this rate maybe the chair that's due the first or second week of March might beat the sewing cabinet! Day for the Lakeside Retreat has been set for June 7 through 10. I'll be working on flights for my Mom's trip out. This has turned out to be an annual visit for my Mom. We have so much fun being able to sew this weekend together with the girls. Enjoy your weekend, our weather is terrific these last few days and expected to continue much the same over the the weekend. 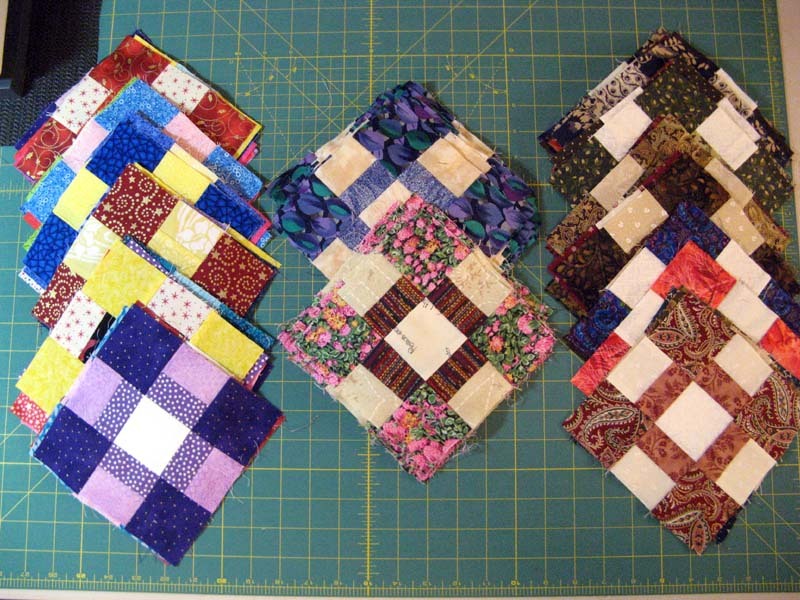 Today I received Sue's Chunky Churndashes Swap Blocks. I also heard from Jeanne that she will be delivering both hers and Sally's over the weekend. Now if only the post person would deliver Connie's I'd have them all! 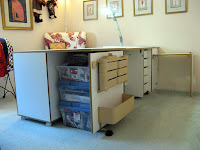 I haven't received word from the local delivery company that my Koala Sewing Cabinet is in San Diego. Still have my fingers crossed that it's delivered tomorrow... Hope I have something wonderful to post tomorrow. 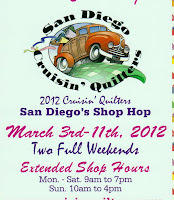 March 3rd - 11th, 2012.
fourteen validations will still be eligible to win other great prizes. We hope to see all of you at our shops this year! I didn't get Connie's Chunky Churndashes Swap blocks as I thought I might today. Guess the mail person will deliver them tomorrow. Buzzer is going off on my Tortilla Soup...gotta go! 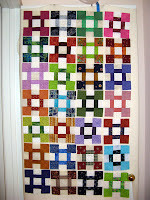 Got one more Chunky Churndashes Swappers block tonight. This one is from Susie. Thought I might see Jeanne tonight and get hers and Sally's but no Jeanne! She doesn't live far from my home so I'm guessing she'll be dropping them off soon. I didn't stay for the lecture and trunk show tonight. I was anxious to get home and to bed at a reasonable time. That alarm clock goes off pretty early on work days. Until next time enjoy your spare time quilting! I had a good sewing weekend. 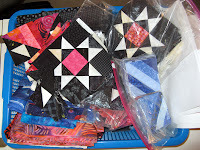 I finished my February 2012 UFO with Patchwork Times. This is my Sunshine Pineapple design that I'm calling Kokonut No! I learned a thing or two with my new Phaff. 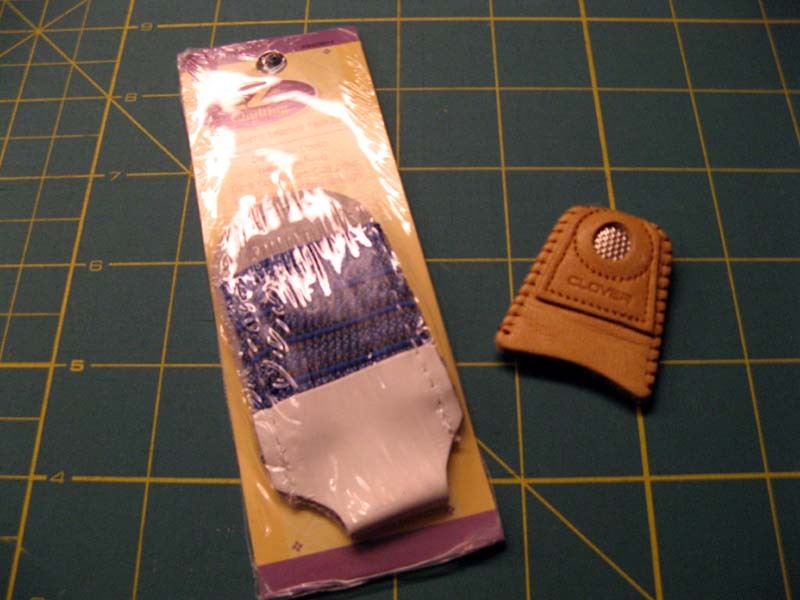 Zigzag stitching with monofilament. This is the technique for attaching the pineapple leaves. 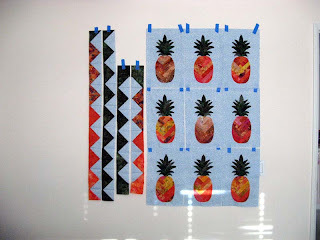 I used a blanket stitch to attach the pineapples in a melon colored thread. I'm totally happy with the results. The extra colors in the outer border add a little interest too. 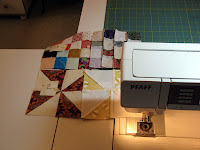 Next project to concur for February is the bear paw with Jo's Country Junction's Quilt Square Quilt Along. There will be more on this in coming days. Tonight is Canyon Quilt Guild meeting night. Terry Waldron "The Art of Landscapes" has a lecture and trunk show. 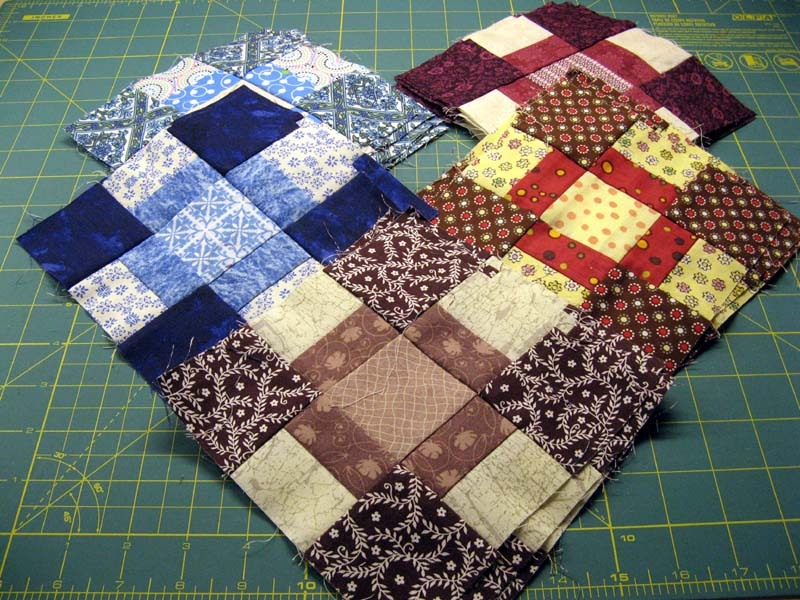 I always admire this type of quilting, but give me a scrappy pieced project anyday! 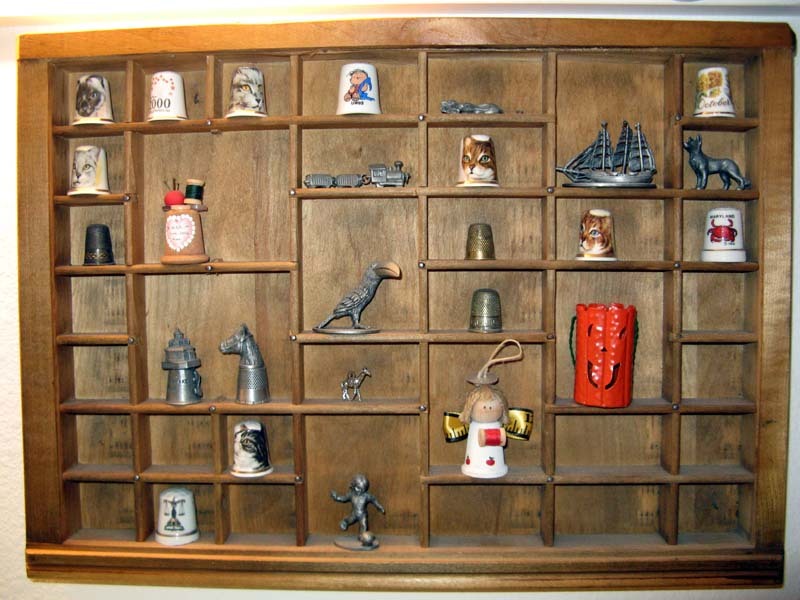 I hope to get four of the five remaining Chunky Churndashes from our block swap. Getting down to the last days for turning in on time. I think everyone is on track. There are lots of us providing eye candy today via Patchwork Times. I'm working today on my Koknut No! project. It is my February 2012 UFO Challenge with Patchwork Times. 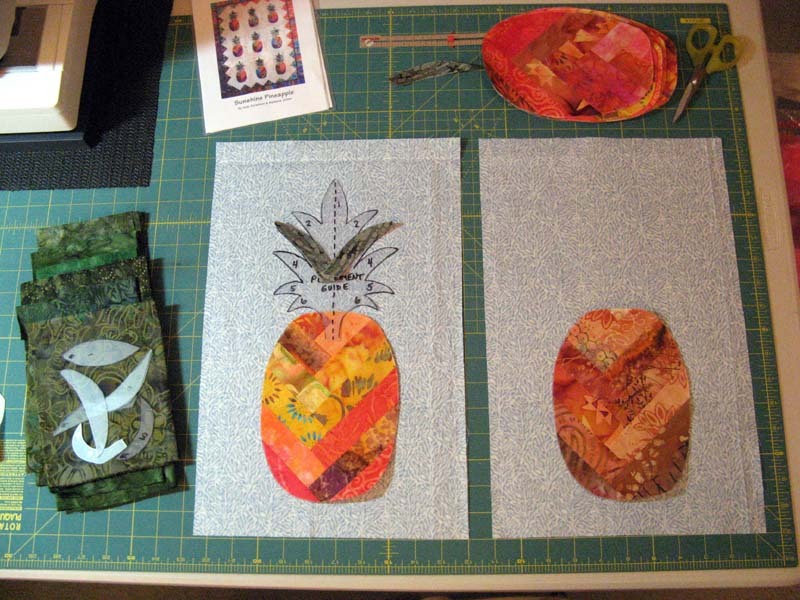 I've still got to finish the pineapples. What remains is the zigzag stitching around the leaves. The four strips to the left are the first border. 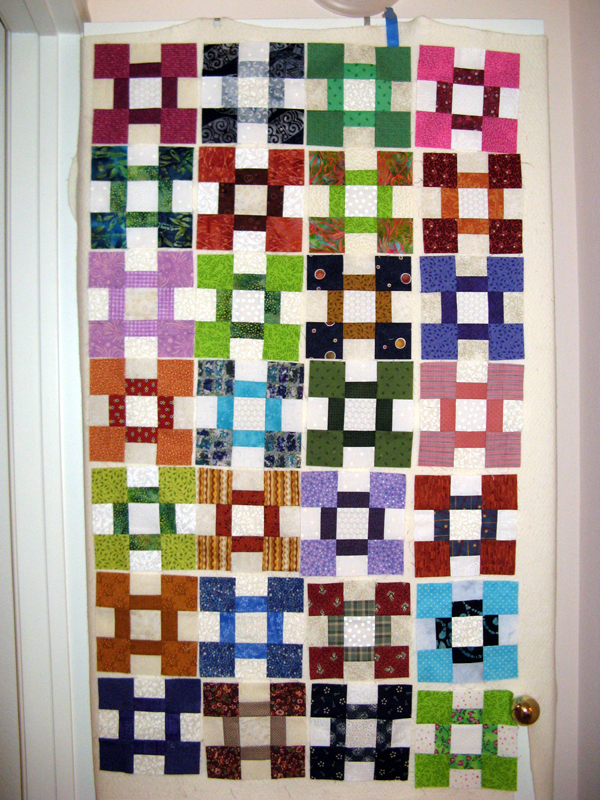 Next is a solid green narrow border and last a piano key border where I will bring in some other colors...not too many...just enough to add some interest. No purchases this week and nothing ready to claim as used. Last Wednesday I got a call from a local delivery shop to schedule the delivery of my Koala Sewing Cabinet. Even though I tried hard to get them to deliver on Thursday or Friday (so I could have it for the weekend), Monday was scheduled. So excited about this delivery I'm sure you know. Saturday I was in the the middle of a manicure/pedicure and received a call from Koala. Surprised... The representative went on to tell me that they were sorry but the delivery for Monday had been cancelled. What? Turns out Koala still had my cabinet on their dock in Chicago. What? They had the paperwork mixed up and the wrong cabinet had been shipped to me. So disappointed I'm sure you know. I'm told the correct cabinet would ship on Monday. I'm to expect my cabinet now to arrive on Wednesday or Thursday in my area. Delivery hopefully can be Friday. Oh and since I'd not received the chair yet I asked about it. BACK ORDER!!! What? 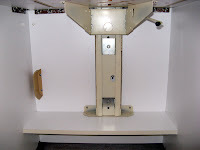 Since this is a taller cabinet I need a bar height chair to sew. Chair won't ship until sometime the first or second week of March! I've waited this long guess I'll need to wait a bit longer. Maybe I'll just have to borrow a friends bar stool...got one anyone? For my stash report this week here's the totals. Be sure to see how others are doing at Patchwork Times. Here we are the middle of the week...starved of sugar after all the sweet festive treats you received on Valentine's Day! ? Only one more alarm clock sound this week for me. Thursday ends my work week this week. I did end up with three more Chunky Churndashes Swappers turning in their blocks last night. 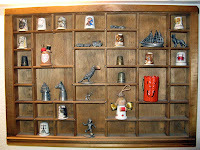 The assortment as you can see from the pictures is grand. Only five more yet to turn in before I can start separating them for each participant. Lots I've heard have already started or even finished the hour glass block which is the only other block design needed for Bonnie Hunter's Project. 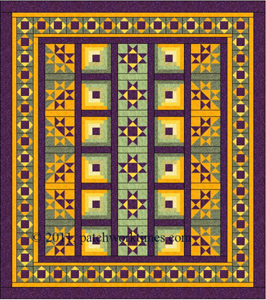 I've mentioned before that this design is available free on her quiltville website. 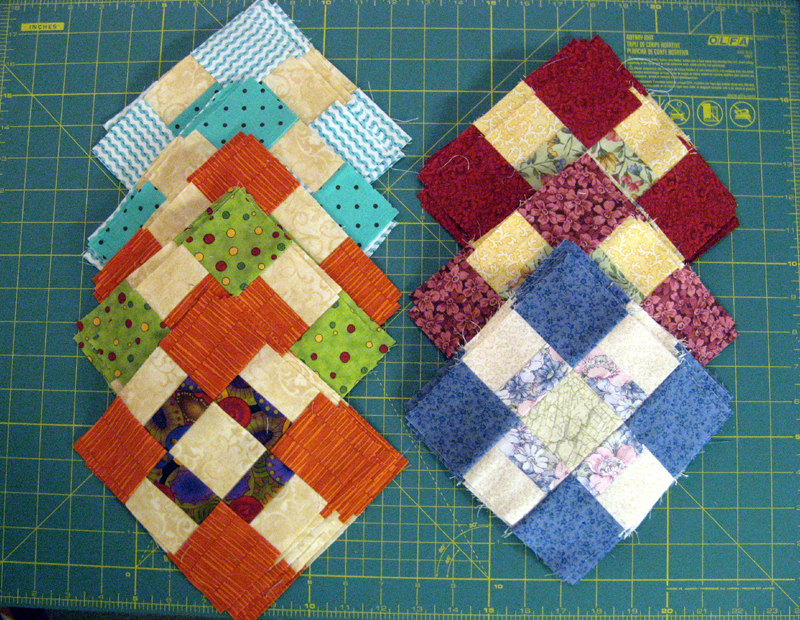 Good for Bonnie Sue and Ingrid, but sad for me that I didn't win either the February BOM blocks or the seasonal opportunity quilt. Winning one of the six door prizes wasn't even in the cards for me last night. There will be more opportunities in the future I'm sure. I enjoyed Ms. Memory Lane's lecture last night; Chris told us all about how she came to own a quilt shop along with her newest opportunities in pattern design. You can check out her shop's website for information HERE. Last night when I got home after guild a FedEx package had been delivered for me. 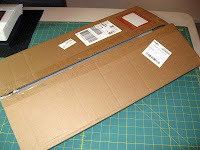 Not expecting anything in a cardboard box of this size...I was surprised that the insert for my new Koala Sewing Cabinet had arrived. I was told this would be the last of the three shipments to arrive since it would be customized for my sewing machine. Wonder if I'll get the chair next which is supposed to be second to my home. Oh it would be so nice to be sitting at my new furniture this weekend! With the new furniture or not I'll be continuing progress on my Kokonut No! project (February's 2012 UFO). Today at lunch break I applied Steam-A-Seam 2 to the pineapple stratas and started the leaves. I think the two brown pineapples will play nice with the others. What do you think? 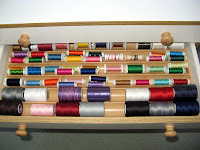 Until next time, hope you find time to sew! Labels: 2012 UFO, Churndash Swap, Koala, Kokonut No! I just love this. So versatile wouldn't you say? It was part of a blog post of Bonnie Hunter's sometime last year. You'll see it again soon as it holds lots of holiday wishes. Each time I look at it I see yet another holiday...How about you? 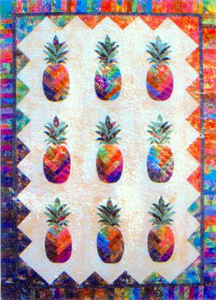 Sunshine Quilt Guild meets tonight. I've got a couple of quilts for sharing. I've also got the block of the month for turn in which makes me eligible to win the entire lot. This month's design resulted in three 4" unfinished blocks. The white fabric was provided. Participants were to add a pink and a red charm fabric. Crazy cut the three and then assemble. We could embellish or not. Kerry made three too and I've got hers to turn in cause she can't make the meeting this month. The mail brought me two more Chunky Churndashes Swappers blocks yesterday (pictures a bit later). I'm supposed to get more tonight...deadline is end of this month. All the blocks are looking great. I think all 16 of us will be happy with this swap! 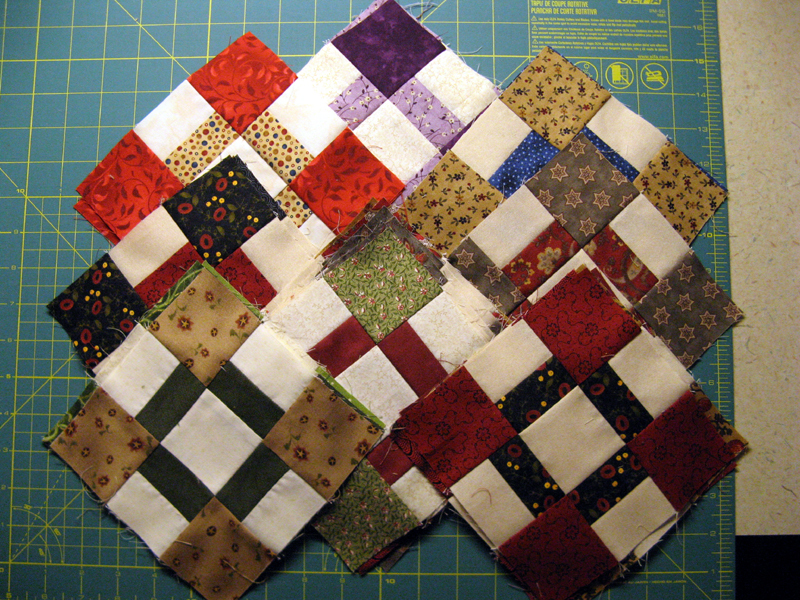 There are already plans underway for a Crabapple Swap that will have us making a bunch of 9-Patches. Happy Valentine's Day to you. I hope something sweet comes your way today. 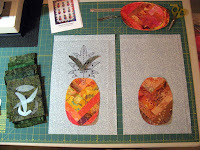 I've been working on my Sunshine Pineapple by Vicki Stratton and Barbara Jones. This is my February 2012 UFO with Patchwork Times. 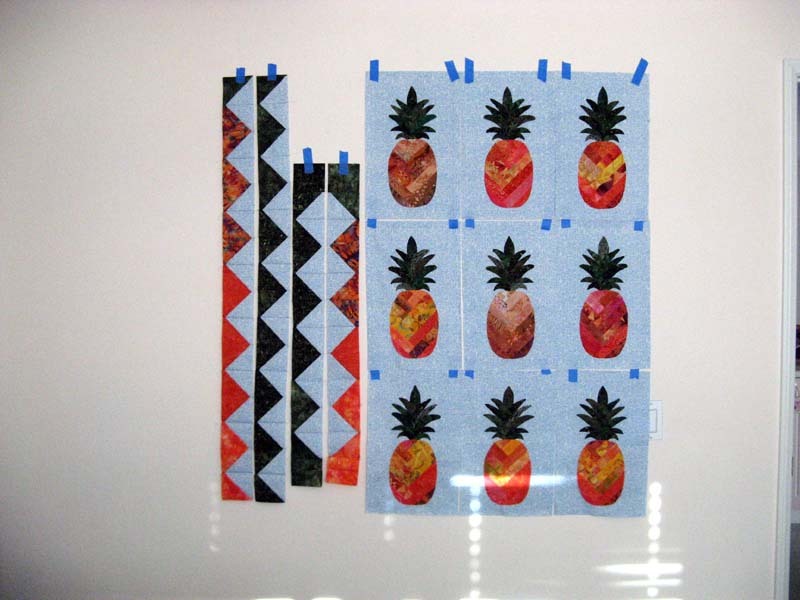 I've got the fabric foundations ready for the pineapples. 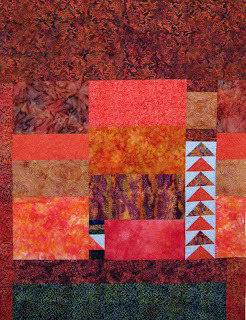 It's the oranges, golds, and burnt oranges sewn in a half square log cabin layout. The burnt oranges are sticking out right now, but I think they'll give just a bit of change to make all the pineapples a bit more interesting...if not they come out! Fusible web along with the fabric foundations get cut next. The greens are for the leaves which are next up. This assortment will be the first border. They will combined the background into half square triangles. Then there will be a small solid dark for the second border. Finishing up with a piano key outer border which will be all these scraps. My entire project is using scraps. I was really hard pressed to use this great blue print background. I've been holding on to it for just the right project...this is it! Koknut No! is in full production. 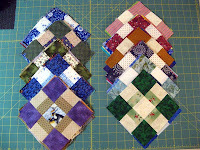 Check out other great projects with the link on my side bar to Patchwork Times. Labels: 2012 UFO, Design Wall, Kokonut No! Keeping Kool is finished. 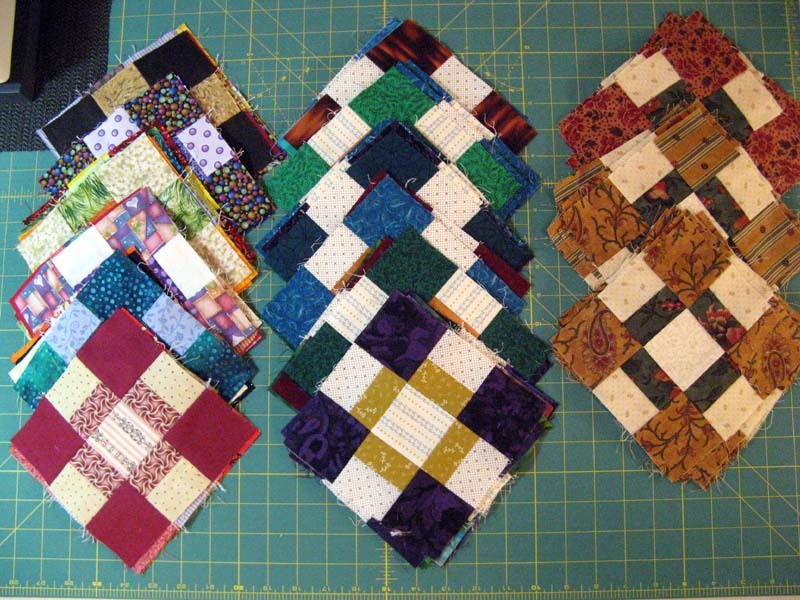 This project was a Row, Row, Row Your Quilt Exchange that began in late 2009. 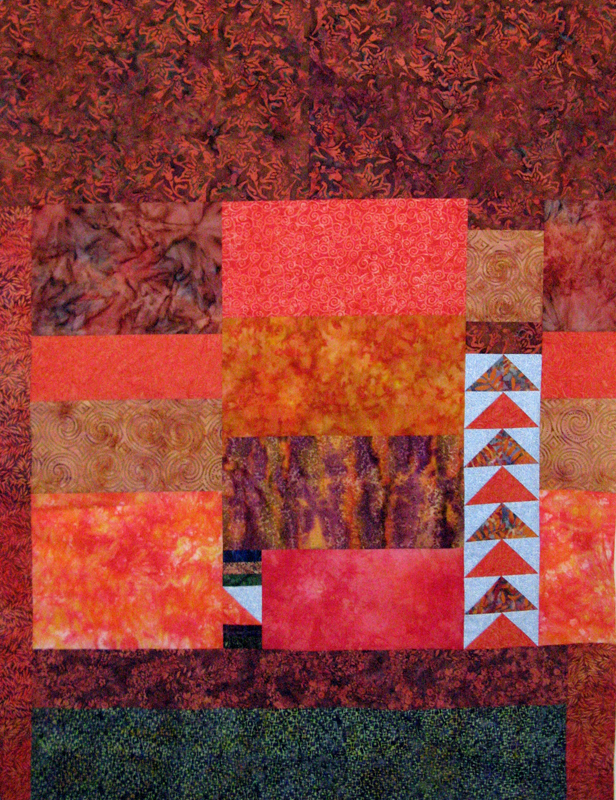 It was coordinated by Karen for the yearly challenge at Sunshine Quilt Guild. It started out with the sea gulls that I assembled. I asked for a beach scene and the gals did a great job giving me just what I asked for. Kerry, Karen, Jane, Sherri, Bonnie Sue and Hallie did an awesome job. I'm more than happy with my project. 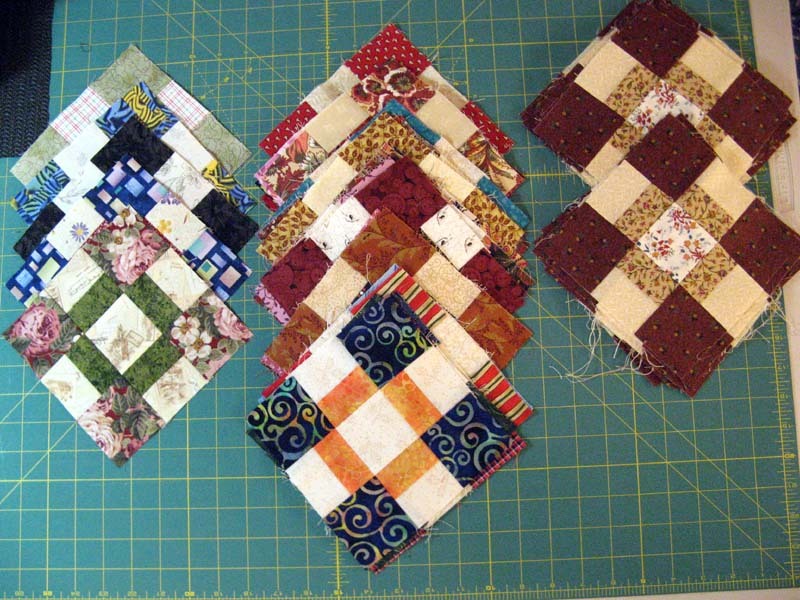 These three blocks are the BOM for Sunshine Quilt Guild. I tried out some decorative stitches yesterday on these otherwise simple crazy cut blocks. The "kit" came with the white fabric. Participants were to add a pink and a red 5" square...slice and dice two times and rearrange the pieces and sew back together. We were encouraged to embellish. The blocks finished at 4". 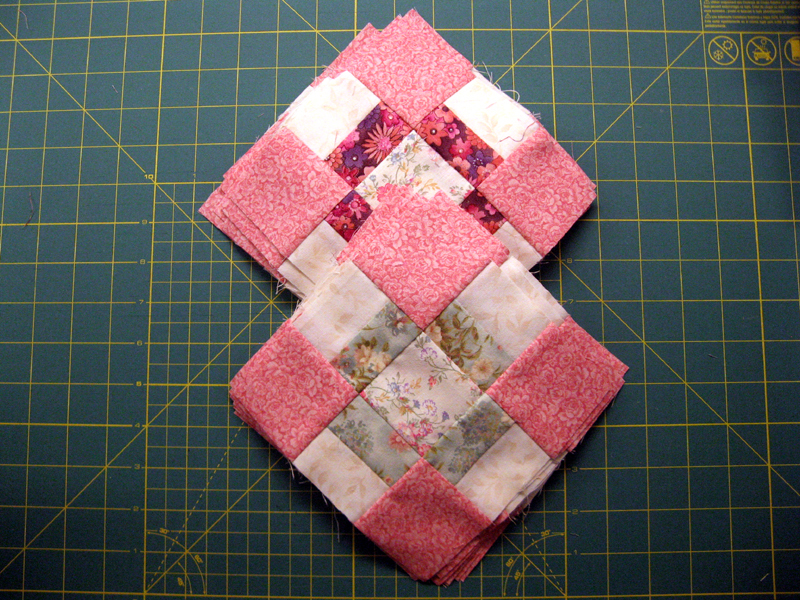 I'm anxious to see what others chose as their red and pink...be kind to your long arm quilter! Here's the number for this week. Only a bit used...not worth updating...but nothing purchased which is excellent! So the report stays as it ended last week. I'll be working to have something in the used category next week. 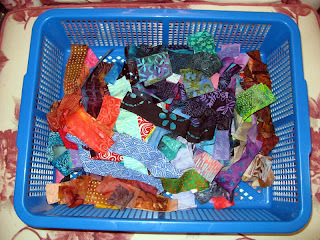 This week starts with pulling fabrics from stash for my two February UFOs. 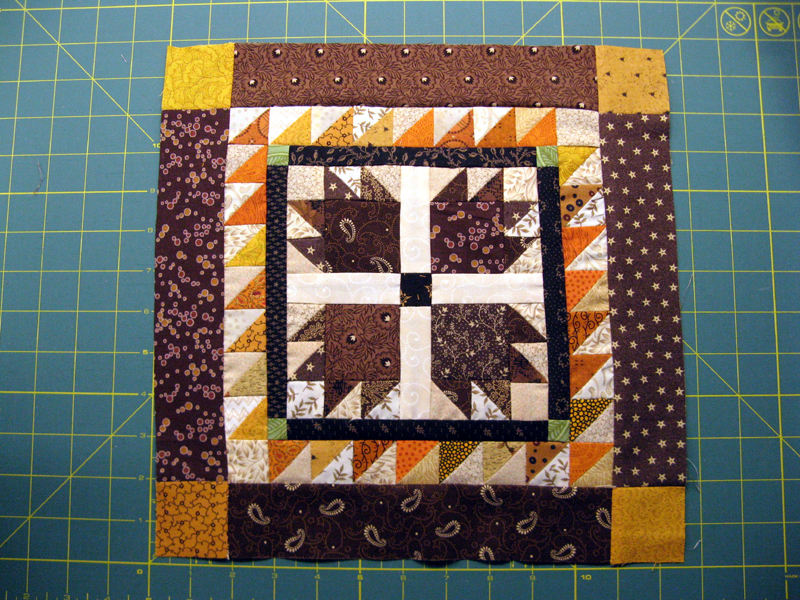 First up is the Bear Paw 12" square block in this pattern by Lori Smith. It's part of Jo's Country Junction Quilt Square Quilt Along. 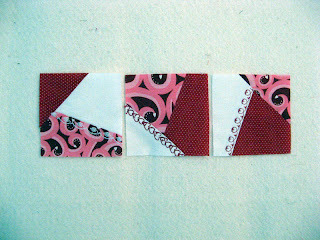 In March another block from this pattern will be selected and then we move on to Quilt Squares #4 pattern. This is going to be a fun project to work on throughout the year. The Bear Paw design is one of my favorites. Is it one of yours? 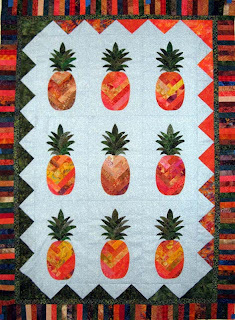 Sunshine Pineapple by Vicki Stratton and Barbara Jones will be put together in February too. I'll be using stash and leftovers from the workshop I took at Road to California, Scrappy Layered Log Cabin, so I'll be getting to both of these in February. I've already come up with a "K" name for this 2007 purchased pattern. (I've had lots of time to think of one...) Kokonut No! I got Keeping Kool back all quilted and ready to bind this weekend from Kerry's Quilting. Kerry did a great job changing up the quilting pattern on each row. This project was a row exchange coordinated by Karen Collin as a group project with Sunshine Quilt Guild in 2009. I'll be showing you this cute quilt a bit later this week. I've got a bunch of embellishments to put back on (not good to have on during quilting) before I reveal it to you. Don't know which row is my favorite. I'll be anxious to see which one you pick. Check out other Design Walls this week via Patchwork Times. I have continued good news to report this week. Three tops went to Kerry's Quilting for stitching and that means more yardage to claim as used. I was also good and stayed away again this week from any purchases. Again my net goes higher YIPPEE! Komplikated is a late 2011 UFO finish. I've got several more 2011 UFOs to finish but this one is one less! 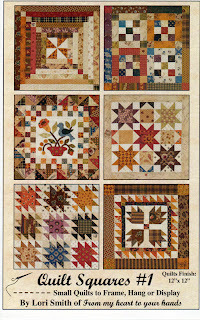 It's a Bonnie Hunter pattern called Patches and Pinwheels featured in Quiltmaker Magazine September/October 2008. I made mine rather unintentionaly rectangle, but I'm not dissapointed. Couldn't understand why I had some many extra blocks. Thought I counted right, but still why the extra...oh well I said I'll use them on the back. When I went to calculate the yardage I realized I'd calculated the number of blocks across wrong. According to the pattern it should have been 13 blocks across by 13 blocks long. I for some reason stopped at 11 blocks across! Kerry got the benefit of this error as she will be making the same project...no waste between the two of us. Kindhearted Klues is a new project for 2012. It was the mystery at Road to California with Tracey Brookshier. The pattern is called Candy Hearts. Minky for the back on this one that will be gifted to my 4 years young niece, Morgan. 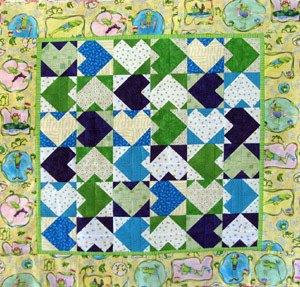 The thread will be green and the pattern a cute one that's frogs for the quilting. 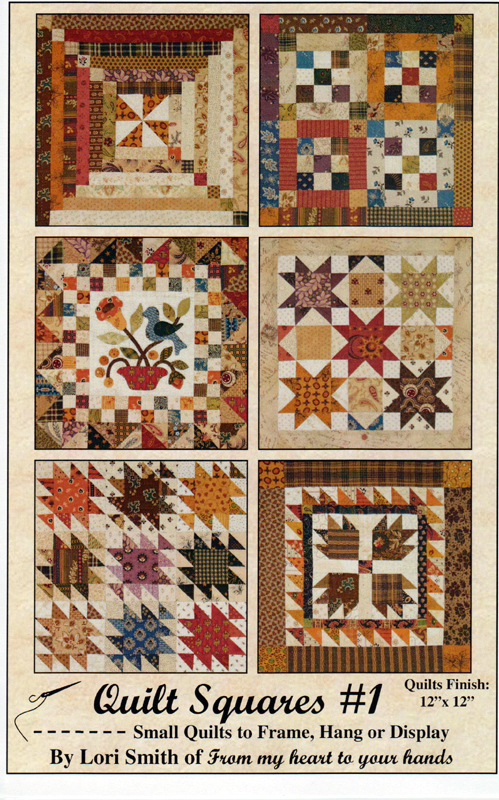 Not sure what the yards would be calculated for this Log Cabin Quilt Square. It really is just a bunch of scraps. 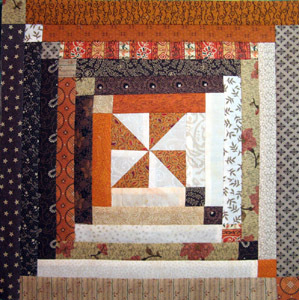 It is from Lori Smiths's pattern Quilt Squares #1. 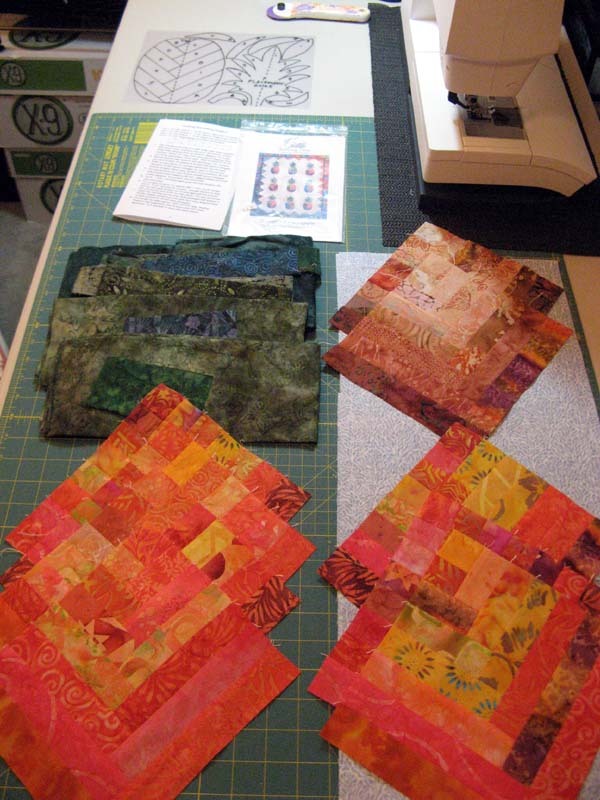 I'll be making more of her 12" x 12" blocks with Jo's Country Junction Quilt Square Quilt Along through 2012. A sampler is my current thinking. February's block iw a Bear Paw Quilt Square from the same pattern. Here's the number for this week. Hope you are on a good path to using your stash this year. Furniture is in like new condition. 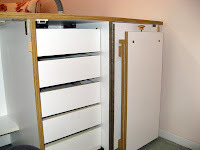 Cabinets are white with oak trim finish and easy-roll lockable wheels. From the manufacture’s catalog the sewing cabinet is similar to Model 2139 with an added option of 5 drawers and a side table that folds down easily on the right side. Sewing machine opening is 19”W x 11”D. 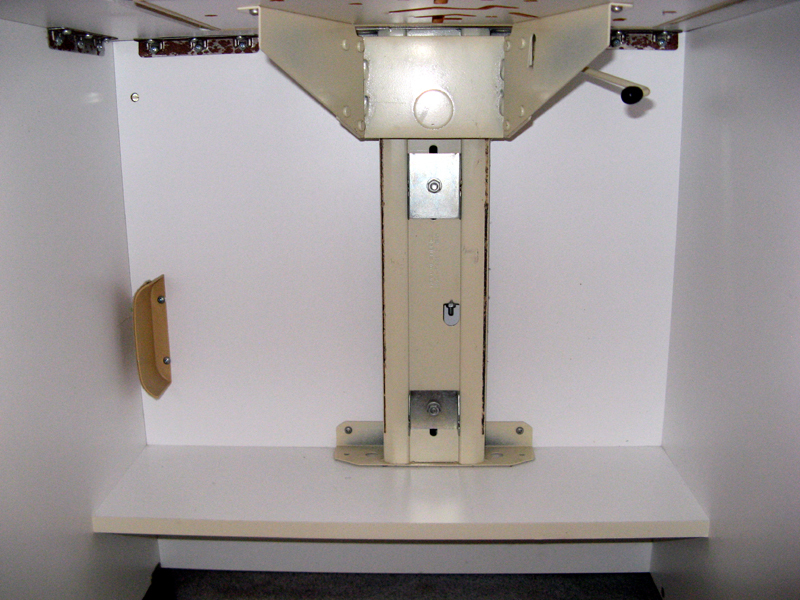 Plastic insert can be purchased new through HORN to fit your machine (available from me is one that fit a Pfaff 1171). 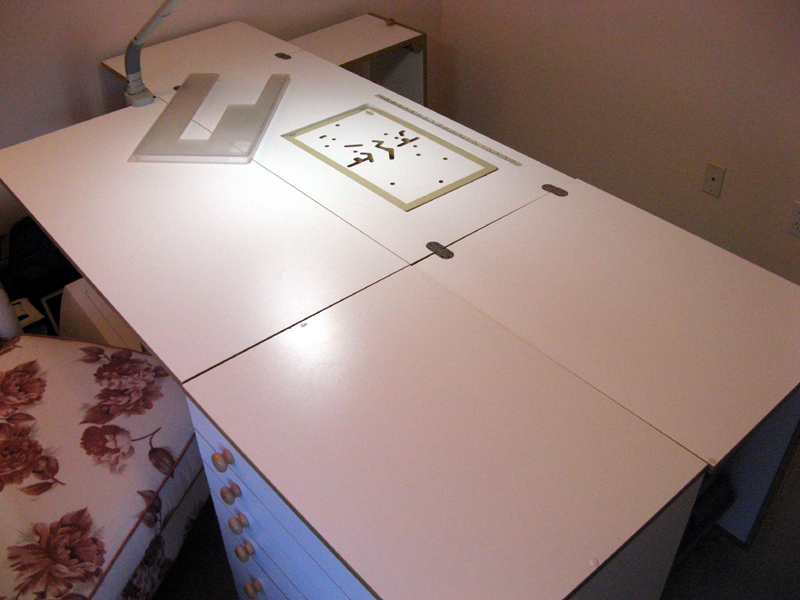 The side table works well for ironing, a serger, or additional workspace. The sewing cabinet is also lockable. 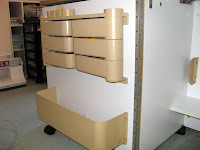 The storage caddie is similar to Model 16 but with four shallow drawers and two deep drawers. 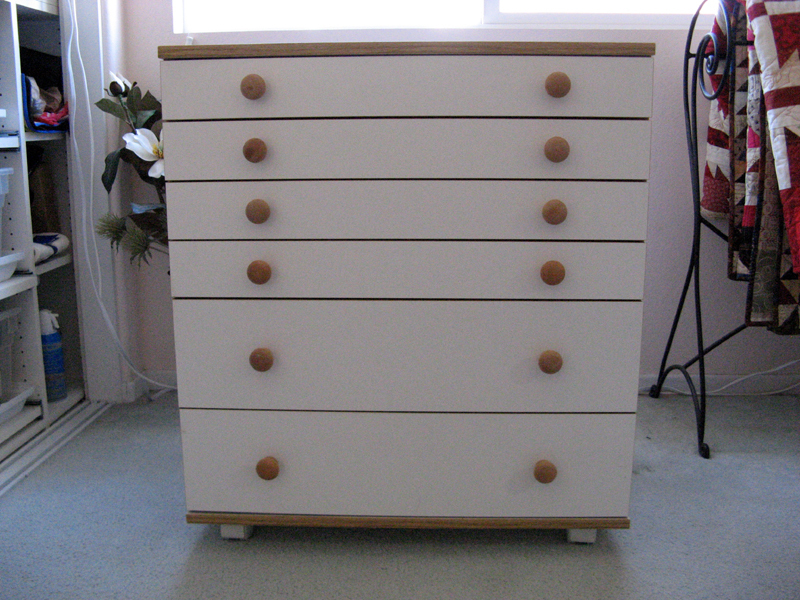 One drawer has a large thread tray that is removable. The storage caddie can be stand alone or rolled into the sewing cabinet with the drop leaf extension surface in the upright position to provide a larger working surface. 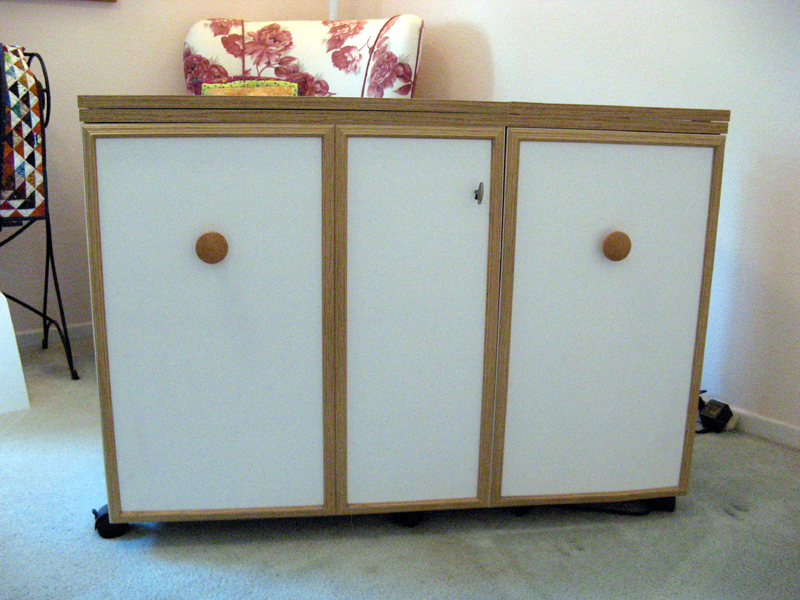 Open sewing cabinet with storage caddie and drop leaf extension surface upright position 84”W x 39”D x 30”H. With drop leaf extension surface in the upright position an additional 12”W x 23”D added to the right side. Happy February and more importantly Hump Day! I have been real happy with my sewing these past couple of days. Monday night I spent time getting everything for my Chunky Churndashes project caught up. I had all 30 of the Chunky Churndashes blocks that I will swap complete, but needed to complete the rest of them. 61 are required for the project. I coordinate a swap with 15 quilters for this Bonnie Hunter design that is FREE on her website. Everyone is to have 30 blocks to me by the end of February. I'll be sending back two from each of the participants to all 15. This means half of the blocks will be exchanged for every one's project. 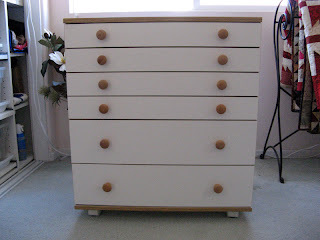 A great way to get that scrappy feeling with only a few fabrics. The second block design which everyone will do for their own project is an hour glass block with a dark and a neutral. The dark is constant and the neutral should be scrappy as a continuation of the swapped Chunky Churndashes. I've not decided yet on my dark; it will have everything to do with what's in my stash. Tuesday night was spent laying out a delinquent 2011 UFO, Komplikated. For some unknown reason I made more 12-patch blocks and light pinwheels than were required. It was nice for the variety afforded me in the layout with the extra pinwheels. All not wasted though as I'll use them on the back in some way shape or another. Tonight I plan to sew the blocks and rows together. There isn't a pieced border in the plans for this project...13 rows to sew and another chalk mark in the finished column. I can just see the "Used this week" increasing this Sunday! I think then I'll work on Orca Bay, my Kordova Klosure. I put it aside to get some other projects with due dates finished. I'm somewhere along in Part 7 with only Part 8 assembly to complete. Judy with Patchwork Times has made the selection for 2012 UFO February #1 which is my Kokonut No! 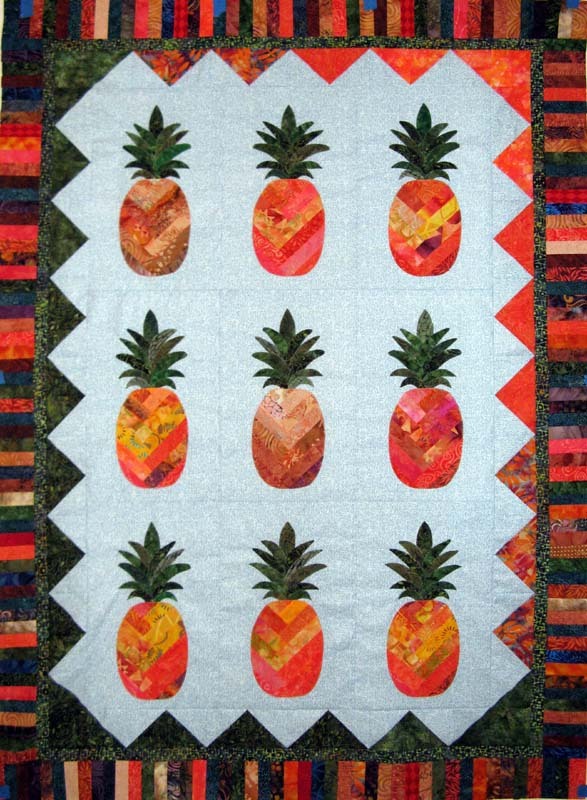 This is a pattern called Sunshine Pineapple a Quilting Time Pattern 103. I've been wanting to make this one for years...since 2007 when I purchased the pattern. Now is it's time! 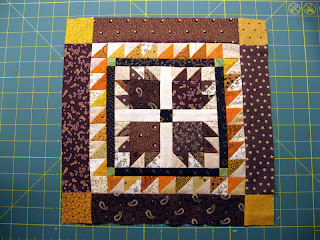 Jo's Country Junction Quilt Square Quilt Along for February is the Bear Paw design. I'm told this one takes a bit longer to assemble than the Log Cabin...we'll find out! I'll be using the same fabrics as the Log Cabin with hopes to put all twelve 12" blocks together as a sampler when 2012 comes to a close. That's it for now. Will you be participating in Bonnie Hunter's Yard Sale on Saturday...I am! Check back Saturday to see what I'm selling.